Recently compiled statistical information confirms Oklahoma continues to rely heavily on the federal government for its financial viability and maybe its very existence. This comes against the backdrop of all the anti-federal government whining among conservatives here about overspending and deficits in Washington, D.C. Here are some questions: If Oklahoma paid its fair share to the federal government, what would happen to its health and education systems? What would happen to the economy? Could it even exist as an independent state? Without help from taxpayers from other states, such as New York, Oklahoma would lose approximately $12.5 billion a year if it got back dollar for dollar what it paid to the federal government each year in income, payroll, business, excise and estate taxes. Last year, the entire state budget for Oklahoma was only $7.1 billion. Here’s how State Smart breaks down the numbers from Oklahoma: Using data from the most recent years available, Oklahoma received an estimated $38.6 billion from the federal government, which includes $7.6 billion for programs like Medicaid and Temporary Assistance for Needy Families; $22.2 billion in payments and grants for programs such as Social Security and Medicare and Pell Grants; $2.1 billion in federal contracts; and $6.7 billion for the salaries and benefits of federal employees. Oklahomans and the state’s businesses paid in $26.1 billion to the federal government during the same time period, with more than 75 percent coming from individual and payroll taxes. That’s a $12.5 billion difference, with Oklahoma on the receiving end. By comparison, the state of New York, using the same calculations, received $191.6 billion from the federal government yet paid in $207.4 billion. That means New Yorkers paid an estimated $15.8 billion more in taxes that they received back from the federal government, which is more than enough to fund Oklahoma’s shortfall. According to the available statistics that have calculated this information through the years, Oklahoma has long been known as a “receiver state,” or a state that receives more back from the federal government than it pays in federal taxes. In itself, there’s nothing intrinsically wrong with this system. The country needs the federal highway system and federal outposts, such as courts, offices and military bases, in all the states. Some states will always have to give more to support the country as a whole. This helps keep our country’s democracy functioning. But what should continue to aggravate progressives and, really, everyone here is the relentless criticism by some conservatives about the overspending of the federal government and the push on the state level for more tax cuts for Oklahoma’s wealthy. I’m reminded especially of Gov. Mary Fallin’s argument in a recent State of the State speech that Oklahoma has something to teach the federal government about fiscal responsibility and her recent campaign television advertisements bashing the federal Affordable Care Act. Is the lesson that you should criticize a larger and more powerful entity that basically provides for your financial viability, that, let’s face it, actually provides for your existence? It’s as if Oklahoma is an immature, spoiled child complaining about his/her generous and loving parents. Remember, that’s $12.5 billion spoiled. The anti-federal government rhetoric here is hollow and shallow. It’s reductionist sloganeering. It’s not rooted in reality. It’s hypocritical. It’s not helpful for the vast majority of Oklahomans, only the wealthy and conservative politicians pandering to low-information voters so they can get elected. It’s dumb. 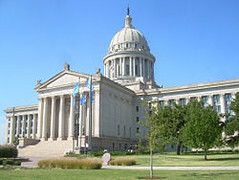 The truth is Oklahoma, with its low taxes and its budget of only $7 billion or so, remains a state with poor medical outcomes and health systems, dreadfully underfunded education systems, extreme costly weather disasters and rotting infrastructure, and the only thing that keeps it afloat are tax dollars that come from other states. The following question is purely speculative and philosophical. Could the state even exist as a separate entity if the billions of dollars provided by taxpayers from other states were eliminated, the Oklahoma legislature continued to reduce state revenue through tax cuts for rich people and the recent oil and gas fracking boom here went bust? I believe it would certainly create a new mass exodus from the state. Sure, it’s difficult to imagine all that happening at once or Oklahoma becoming a part of Texas or part of a newly formed state carved out among other receiver states or perhaps even a federal territory again, but more extreme events in history have happened and will happen in the future.